Events are the key component of any Preceden timeline. Events can represent anything from an upcoming project milestone to the building of the pyramids and anything in between. Below is an overview of each of the options along with a description of how those settings impact the appearance of the event. If an event has a start date only, then its name will always be placed to the right of the icon. If an event has a start date and an end date, then its name will be placed within the color bar, if the name fits. Otherwise, the name will be placed to the right of the bar. You can change this behavior under the timeline's settings to have Preceden always display the name to the right of the colored bar. You can enable or disabled autocompletion from your Account page. 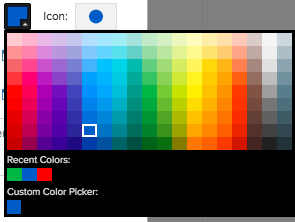 You can also use the custom color picker at the bottom to choose a color not on the palette, just click on the square under Custom Color Picker. 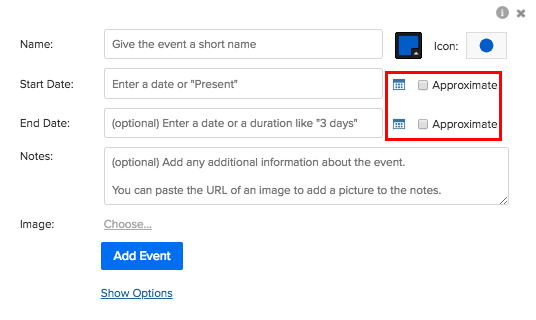 If you specify an end date for your event, the icon will only appear when you hover over the event and in the event list below the timeline, since the event will be displayed as a colored bar. 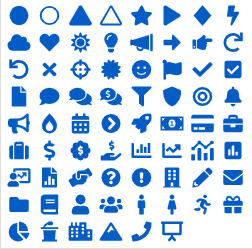 You can also request additional icons: Request a New Icon. To add a layer, click the Add Layer link above the timeline (see Layers for more details). Every event must have a start date to let Preceden know when the event occurred. You can use the date picker or type in a date in one of the many date formats that Preceden supports. If you have multiple events on the same day, you can enter a time after the date to organize the events in their proper order (E.g., November 23, 2019 7:30 am). When two events start at the same time they will be ordered alphabetically. Therefore, if you want one event to come before the other, name them accordingly. Marking an event that only has a start date as approximate has no impact on how the event is displayed. Similar to the start date, the end date specifies when the event ends. This field is optional, so if the event only has one date associated with it, you can leave this field blank. You can specify durations for the end date such as "1 week", "1 month 5 days" etc. Also note that both the start date and the end date are inclusive. This field is for any additional notes about the event. These notes will be displayed when you hover your cursor over the event on your timeline, as well as in the list of events below your timeline. You can add images as well as links to the notes. Notes also support Markdown formatting. Click the Choose.... link to add images to your timeline. Learn more about how to Add Images to Your Timeline. A milestone represents an important event that you want to stand out on your timeline. 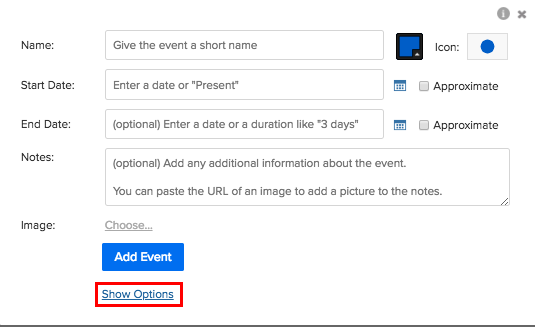 If your event contains multiple events, you check this box to make your event start when another one ends. Learn more about dependencies. To unhide the names, simply click on the icon or color bar and the options will appear again. You can have Preceden include the time between this event and others using this feature. Read more here: Highlight the Time Between Events. 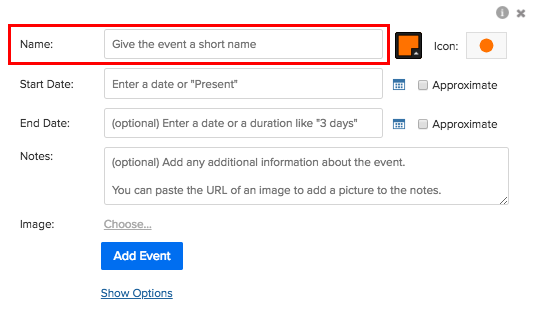 If you want to add the same event that already exists, you can click on the event name. In the bottom, right hand corner of the window you will see the Duplicate Event link. Click on it and the duplicate event will automatically be added to your timeline.